In this technique tutorial we’ll be looking at minimalism, one of the most popular styles used by live visual performers and VJs. Like the minimalist movement in painting and photography that was developed in the 1960s, this form is marked by its usage of geometric abstractions, negative space and mostly monochromatic color spaces. For live visuals, particularly when accompanying music, these ideas are often further extended into the dimension of time. For musicians working in Ableton Live or other multitrack production software one of the most useful tricks for driving real-time visuals is to output each sound track on a different set of audio channels before they are mixed together to get more accurate results for each sound when performing audio analysis in VDMX. Using individual plugins to directly automate the control of different aspects of a video performance or interactive installation can create some pretty awesome results, but one of the most powerful capabilities of VDMX is the ability to connect these plugins to each other to create more complex behaviors and visual effects that can be switched between during live VJ performance. For this set of tutorials we'll look at a few ways that the Audio Analysis plugin can be used alongside the LFO plugin and standard interface controls as a demonstration of this technique. 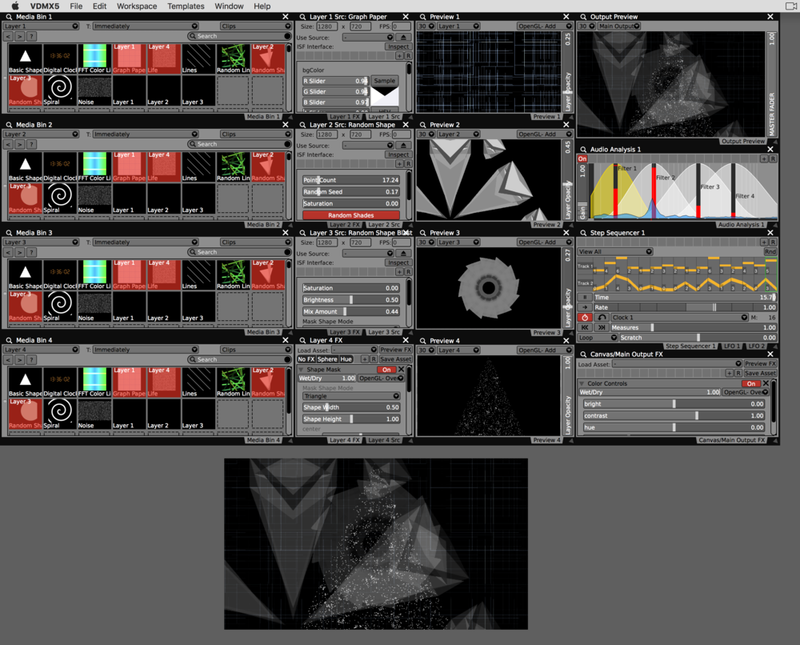 Along with the produced control values that are used to directly automate interface controls like sliders and buttons, the Audio Analysis plugin in VDMX provides its input waveform and FFT values encoded as grayscale video streams that can be used to create real-time music visualizers and advanced sound reactive effects. Among the many uses of Quartz Composer, and perhaps one that is often overlooked, is the ability to make visualizations of data and other information. Since the compositions are rendered in realtime, when creating them for this purpose it can be helpful to make the patches reusable with published input values for use in other environments, or replicating within QC itself. In this two part video tutorial we'll first create a composition in Quartz Composer that renders a simple bar graph data visualization with inputs for changing its labels and values that can be used in other applications. Once the patch is completed it can be loaded into VDMX and set up to respond to a variety of different inputs as a visualizer of tempo or audio levels as part of a VJ set, an on screen display of MIDI / DMX channels, or any other arbitrary data that you can get into your computer by OSC. ​In this quick tutorial we'll be looking at how to use the Audio Analysis plugin instead of the typical keyboard MIDI, OSC, or DMX shortcuts for triggering video clips in a media bin. This can be a particularly useful technique for using VDMX to run interactive installations that respond to sound and other inputs, or for automating and beat syncing parts of a VJ setup. Since it was started about a year ago the iLoveQC website has become one of the top resources and community sites for Quartz Composer developers and Mac VJs using the node based language. If you haven't already taken the time to check out the site, they've got some great interviews with artists, tutorials to get started, FX for download and even Final Cut Pro plugins for non-realtime video production. For this guest tutorial we're joined by iLoveQC founder Graham Robinson, also known as Shakinda who has been part of the in the VJ community for quite some time and is an all around QC guru. An introduction to using the audio analysis plugin to create sound reactive control data.